The adventures of the purple suitcase continues with Nicole's search for accommodation around Vancouver. Oh, life is good. I have survived my first few days in Vancouver and I’m already in love with this city. If you were ever worried about cliches being true, half true or entirely false, Canadians have earned their international reputation. Every person I’ve encountered so far has been nice and helpful beyond my imagination. Personally, I like to take the first day, two days, to just explore an area that I’m traveling to. My B&B was near Robson Street and only a ten minute walk to English Bay, which has quickly turned into my favourite spot in Vancouver. Whenever it’s sunny these days, my first stop is there. English Bay has quickly become my favourite spot in Vancouver. Pumped with all the excitement of having started a new adventure and having seen some of the sights already, my first week was all about settling in. Moving2Canada has a great guide about the first seven steps for the first seven days. The most important one, obviously, is to find a place to live. I’ve researched beforehand which areas I like the best and how good the public transportation is in those neighbourhoods. About a week before my departure I started contacting people about appointments to look at rooms. Like many other newcomers, I had the best luck finding listings on Craigslist and Kijiji. Apartments and rooms here tend to be snapped up pretty quickly, so it doesn’t make much sense to start writing people weeks or months in advance. I had five appointments lined up and spread out over two days. My mom (who accompanied me to help with the settling in process) and I decided to rent a car for the week that she was here, which made going from one appointment to the other a lot easier. If you can’t rent a car, the SkyTrain is an excellent way of getting around and it’s fairly easy and fast to get a Compass Card, which works with a simple tap in and out system (similar to London with the Oyster Card). New Westminster, a suburb of Vancouver, BC. 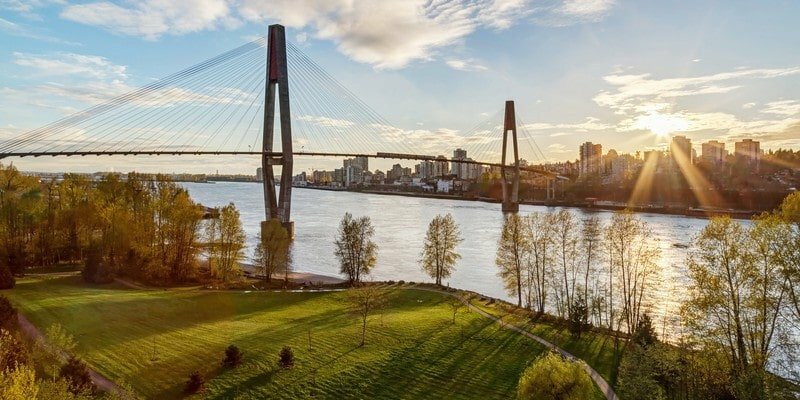 I decided on a room in New Westminster that is in walking distance of a SkyTrain station and allows me to be downtown in half an hour. I’ve noticed that traveling 30 minutes or longer everyday seems like a big thing here, but in Europe it’s more common. I used to have to travel a little over one hour every morning to get to work. So anyone that doesn’t mind having 30 minutes every morning to read a little or scroll through Instagram I would recommend looking into rooms a bit further out, the rent difference is unbelievable! My landlord had a two-page document typed out, a simple rent agreement that was easily understandable and just covered the basic things. Personally, I really like having a written and signed agreement. Create a Moving2Canada account to get regular updates, expert advice, and our FREE Getting Started Guide! If you walk down Robson Street you’ll eventually pass every phone company at some point. Go in, listen to the promotions and look which plan fits you the best. But be careful when researching which phone plan you want to choose. Not only are they astronomically expensive compared to phone plans back home (Austria), but there are a few things that could turn into hidden costs down the line. If you choose a smaller network, because they tend to be a lot cheaper, make sure that they cover the area that you’ll be living and traveling in, because if they don’t your phone will tap into the data/signal of one of the three big companies and your phone will display the word AWAY. If away isn’t included in your plan, you will pay extra for every text, minute or data that was used in the AWAY mode. Choosing a bank in Canada shouldn’t be too difficult if you are only staying temporarily, as you can just browse through their benefits, such as discounts on movie theatres, food and other entertainment and choose whichever bank fits you the best. If you are moving here permanently, I suggest looking into it a bit more carefully. Getting your SIN number is crucial if you plan on working in Canada, because if you don’t have one, you can’t. There are a few Service Canada offices in Vancouver that you can just walk into with your Passport and work permit and the whole process shouldn’t take longer than 30 minutes. For the Compass Card, I personally went to the office of the West Coast Express Line at Waterfront station and I am so happy I went. It’s easy to get the Compass Card yourself from one of the machines, but the wonderful ladies at the office know exactly what they are doing and help you register your card right away, which is important for safety reasons in case your card gets stolen or you lose it. These wonderful ladies can answer any other questions you may have. With these things done and ticked off my list, I spent the next few days just exploring and enjoying our time before my mom flew back home and my life would consist of sitting in coffee shops an applying to dozens of jobs. Nicole, 21, is moving to Canada with dreams of working in the Vancouver film industry. You can read the first installments of Nicole’s blog here and here. Follow Moving2Canada on Facebook and Twitter, where we’ll be posting these blogs as they are published. What a beautiful spring in Vancouver!